A New Dawn Realty Is proud to serve the greater Stokesdale area with high-quality real estate agent services. Whether you’re looking for your first home or looking to sell your fourth home, A New Dawn Realty is committed to providing you with the best service possible. To learn more about our Stokesdale real estate agency, or to set up an appointment with a real estate agent, contact us today. While many people have owned homes and are looking to upgrade, just as many people are looking to purchase their first home after years of renting various properties. While the differences between the two are numerous, in part one of this blog series, we will look at a handful of benefits that come with owning a home as opposed to renting one. For those of you who have spent years renting apartments and homes, you understand the frustration that comes along with this. Every month, your hard-earned money goes towards living expenses, with the money that you put towards this each month never to be seen again. Many people spend years or even their whole life renting, with that money simply going to a landlord or real estate company. One of the biggest benefits of owning your home is that it is an investment. Not only can your monthly mortgage payments be lower than your previous monthly rental costs, but the money that you put towards your mortgage each month is going towards you eventually owning the home that you’re currently residing in. While it takes most people a considerable amount of time to pay off their mortgage, many properties have a tendency to appreciate in value over time. As you grow closer to paying off your entire home, the likelihood of you being able to sell it for a profit becomes an entirely feasible possibility. From there, the possibilities are endless. For those of you who purchase your home outright, paying attention to real estate values each years is a great way to decide if the time is right to sell your home and move onto something better. As the home is technically yours and not the property of a rental company or landlord, the possibilities of making your home more “yours” are far greater than if you were to rent your property. In renting any type of property, most owners or rental companies have considerable restrictions on the sorts of things that you can and can’t do to a home. Don’t like the bathroom or kitchen fixtures in your apartment? Wish you had nicer appliances? Want to knock down a wall to better suit your taste? These are all things that are rather difficult to do if you’re currently renting. When you own a home, however, you have the freedom to do whatever you wish with it, giving you an array of possibilities for customizing and improving upon the home, as it belongs to you and only you. 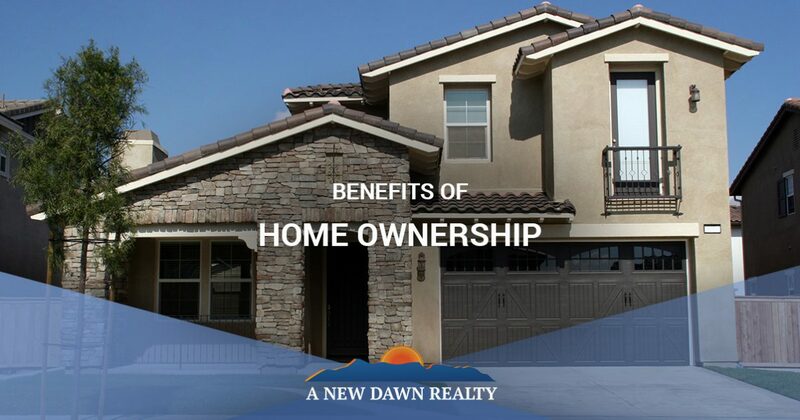 Those are just a few reasons as to the benefits that come with owning a home. At A New Dawn Realty, we are proud to serve the greater Stokesdale community with high quality homes for sale. Our Stokesdale real estate agency is committed to providing buyers and sellers with the best service, and whether you’re looking for a home or commercial property, we are here to provide you with the best in Stokesdale real estate. We will continue this in part two of our blog series, but until then, to set up an appointment with a real estate agent, contact us today!